There are tons of reasons why you might want to give a gift to your boss. It might be to say thank you, a birthday present or it might even be that your boss is a flower person. Well, whatever the case may be, you will need to bring them flowers in different shapes and sizes from time to time. But before you go to any flower shop to purchase flowers for your boss, there are some things you must consider. For starters, you have to think about the occasion, because it can determine to a large extent the color of flower that would be appropriate. The last thing you need to consider is the size of the flower. What can help you determine an appropriate size is thinking about how spacious you boss office is. If you bring a small bouquet when your boss office is very spacious, it will hardly have any impact. So, if you put all the tips mentioned above into consideration, you are bound to purchase a bouquet that your boss will sincerely appreciate. Next, we are going to be considering the top seven flowers you can give as a gift to your boss. The Hyacinths flower is common among gardeners and flower lovers because of it sweet and earthy scent. The fragrance of the Hyacinth is wonderful, and it also can repel pest and other small insects that hover around light bulbs. To make this flower more appreciated by your boss, ask your local florist to create a costume arrangement for your Hyacinth. But you must check your budget before asking for a costume design because they can be expensive. But if you can pull this off; your boss is going to appreciate it a lot. 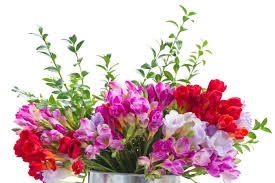 When looking for excellent flower gifts to give to your boss, you should consider the Freesia, because they come with inspiring colors. Reports from the Balcony garden shows that a Freesia is a great option when it comes to gift giving because of the wonderful aroma it has. The Freesia comes in a different array of inspiring colors for you to choose from. They include; hot pink and white as well as other amazing colors. To make a Freesia look even better, ask for a cheap custom design that will match your boss personality or favorite color. Everybody loves the rose flower because of its wonderful scent. In recent times, the rose flower has become associated with luxury, wealth and elegance. To crown things up; they come with a rich natural fragrance. The good thing about the rose flower is that it is versatile and is suitable for any event. But there is a line when you must be on the lookout for when using rose. In Hollywood red rose is associated with romance. So when picking a rose bouquet, avoid the red ones, because they might send a wrong message to your boss. The next flower we are going to consider is the Peony. When the Peony is in season, be sure to grab a well-arranged Peony as a gift to your boss. The only problem with this elegant flower is that they are not always available. They only bloom between April and June. This flower is often used in making scented soaps, perfumes, and other bath product because of their uplifting aroma. If you are looking for something fresh; yet elegant, then a Sweetpea is a flower to choose. What makes the Lily one of the best flower gift ideas option is that they come in vast array of colors, which you can choose from. Before you give out a Lily as a gift to your boss do well to check their background, culture, and tradition because some cultures consider the Lily as offensive. This flower is associated with royalty because of its elegant dark blue and purple color. To make this flower look even better, you should ask your local florist for advice as to how to you can mix it up with other flowers so that it can look a whole lot better.